America’s pregnancy bible, What to Expect When You’re Expecting with 12.8 million copies in print, recently underwent an extensive third edition. Now comes the completely revised and updated Spanish language version. Qué se puede esperar cuando se esta esperando, with 143,000 copies in print, is an exact and complete translation. 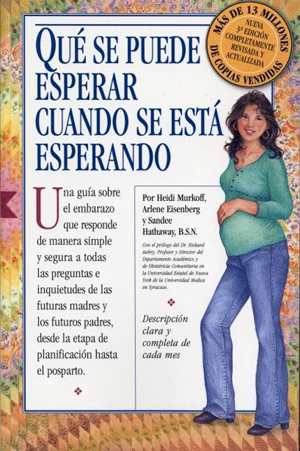 The perfect companion for Spanish-reading expectant parents, it is also a must-have for doctors, midwives, and other health-care providers who need help communicating with Spanish-speaking patients. Qué se puede should be considered basic stock in any store and has been carefully translated by Rosales Communications to be understood by all Hispanic linguistic groups—Cuban Americans, Mexican Americans, Puerto Ricans, Dominicans, and more. Arlene Eisenberg worked on all three editions of What to Expect When You're Expecting and remained active in the What To Expect Foundation until her death in February 2001. She was also co-author, with Heidi Murkoff, of the "What to Expect" magazine columns. Rosales Communications provides translations for the American Pediatrics Association, NIH, the National Cancer Institute, AARP, the American Diabetes Association, and others.